Figs. 1-6, 8. Spongodiscus tetras. Figs. 1-3, 6: fully developed skeletons with rounded edges. Note very delicate secondary growth in discrete areas (especially figs. 1 and 2). Figs. 4, 5: two angular, less developed forms from the plankton net material: BSS 28B(II) (3x), BSW 47F EF T37, IOW 188(F) and BSW 47F EF R24. Fig. 7, 9, 10. 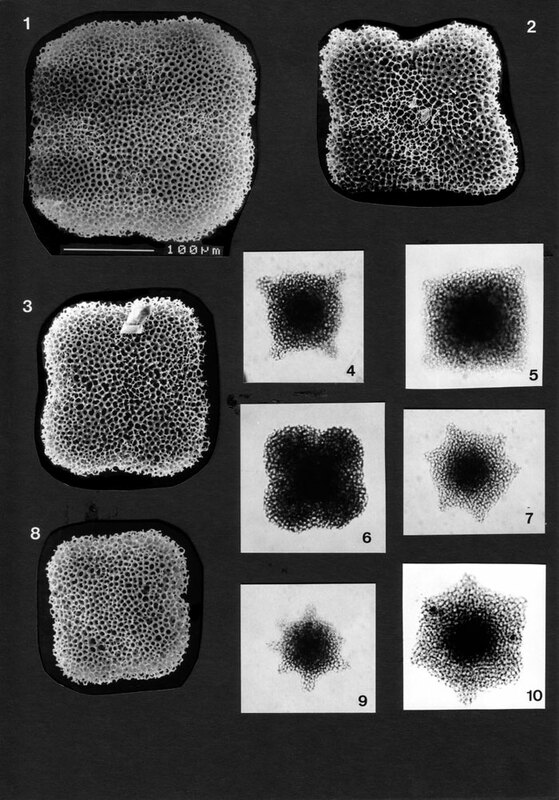 Juveniles of Spongodiscus biconcavus. BSW 47F EF L34, BSW 47F EF 026 and IOW 90(F) (see also pl. 40, figs. 5, 7, 8).